Things emerge I’ve never seen before. What on earth is this? It has Primus stamped on it. How does it work? I haven’t a clue. I put it aside to be washed. It can go to Oxfam labelled ‘possible Primus attachment’ and they can sort it out. And this? I found it in the attic of my first house. 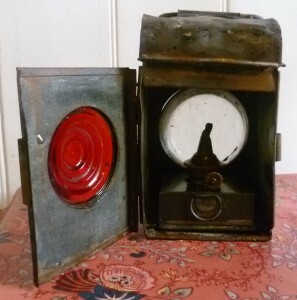 It’s a portable oil/paraffin lamp with white glass at the front and red at the back. There’s a small box for the fuel with the wick still in place. There’s also a hook which slots into something. Is it an early bicycle lamp? A railway lamp? I have no idea. 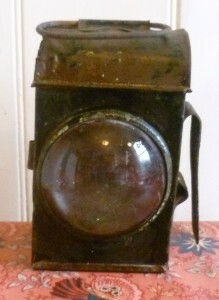 Old portable lamp – back. Note small box for fuel and wick. I start chucking stuff out: solidified tins of paint, bags of musty compost, a dustpan and brush clogged with cement, an old mop. 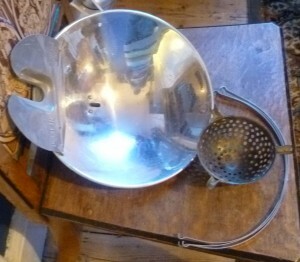 Other stuff goes into my Oxfam pile: old moped accoutrements and a lampshade. My son says ‘Yes’ to a barbeque kit; a friend would like the spare bike chain. Things I want to keep (two tools boxes and garden things) go into the kitchen to be washed or dusted. Soon, I can’t see the kitchen table and the room turns into the Kitchen of Doom. Stuff I can’t make my mind up about goes into the front room. This room has never really recovered from the house being re-wired about ten years ago. I also put coats and jackets from the hall there. They too must be cleared for the laying of the carpet. It becomes the Front Room of Doom. I buy two pots of ready-made Polyfilla and try to stop feeling like a wimp – I should have bought the powder and mixed it myself.. I go into ‘Sod it!’ mode. Some of the cupboard holes are so big that it takes several goes to fill them. I think about putting up a few more nails but stop when yet more plaster falls down. Still, I manage to put up a couple of hooks under the wooden shelf. The day comes. The carpet men arrive. An hour or so later, it’s done. 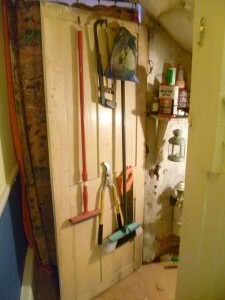 A carpenter comes to trim the cupboard door and, for the first time since 1940, miraculously, it fits! I hang coats and jackets back up in the hall. Shiny tool boxes return to the cupboard shelves and I can see the kitchen table top again. The Cupboard of Doom is now more or less sorted. It will never be a thing of beauty but at least I know what’s there and can get to it. The holes have been filled and the draughts have almost gone. And it now has a carpet. It looks so much better. My Tai Chi teacher says you should clear out old stuff to make space for good luck to come into your life and I realize that I feel both virtuous and somehow emotionally lighter. We shall see! I laughed out loud as I read this Elizabeth. Well done for getting it sorted! 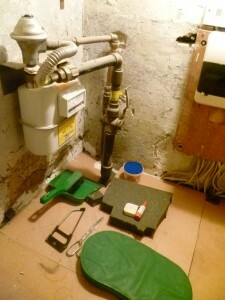 I should also tackle my own understairs cupboard of Doom – but …. Oh, I can identify with this. One of my sons, who has moved out, stored a mountain of stuff that might come in useful one day in my garden shed of doom. Mice, thought: ‘smashing, we’ll move in and multiply.’ So they did. I begged my son to clear the shed of doom but he said he was too busy. Eventually I emptied it, got rid of everything the mice had nibbled and asked my son to collect whatever he wanted to keep. I have now reclaimed a shed that is now free from spider’s webs and mice. 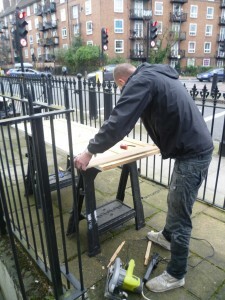 I agree, de-junking cupboards is always a good thing. 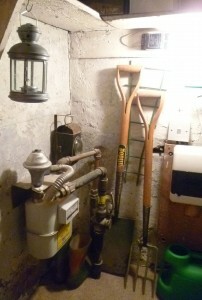 I’m also fascinated what you can find in older houses that somehow accumulate over different decades. Each object would have stories attached to it. You have such an interesting collection of articles in your under stairs cupboard, I am intrigued to find out what you have in your attic! or is that a project for next spring?? Thank you for your comment, Rosemary. 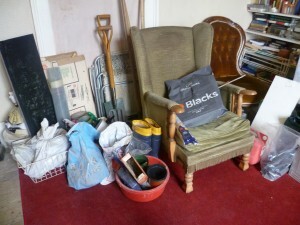 It made me smile – I had similar problems when my children left home – but their clutter stayed put! In the end, I delivered a written ultimatum – with a date. After the date specified, everything would either be chucked or go to Oxfam. It worked. Hello, Nikki. Don’t even mention the attic! Heaven knows what’s up there – I daren’t think about it!